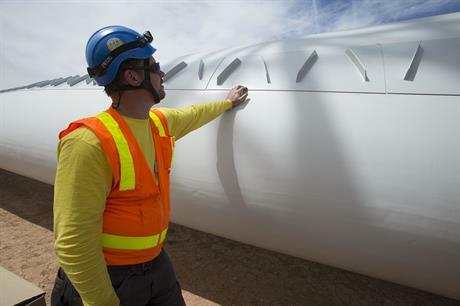 UNITED STATES: The expected addition of 35GW of new wind energy in the US to 2020 will drive 248,000 jobs and $85 billion in economic activity, numbers that many industry participants hope will help endear the sector to a famously antagonistic president. New analysis by Navigant Consulting found by 2020, 33,000 Americans could be working in factories supplying the wind industry, with a further 114,000 jobs in construction and operations, and another 102,000 jobs indirectly supported by wind industry spending. The $85 billion in economic activity will come through investments in new wind projects, manufacturing, construction and operations expenditures, as well as tax payments. "It's important to note that 99% of all this activity is in rural America and in 'Rust Belt' America," Tom Kiernan, CEO of the American Wind Energy Association (AWEA), emphasised during a webinar unveiling the study results. The so-called Rust Belt, which includes parts of the north-eastern and midwestern US that have seen a decline in industry and manufacturing, was vital to Donald Trump's election win. "If Trump says manufacturing is important in the US, and jobs are important in the US, we need to make sure we're hitting that theme," said Vestas' US CEO Chris Brown. Arguments about wind's environmental and emissions reduction advantages are unlikely to gain much traction with either Trump or the Republican-dominated Congress, panelists agreed. "It's not about cloaking ourselves on the renewables side. It's about emphasising local economic benefits, which are jobs and landowner payments and local government revenues," added EDF Renewable Energy director of regulatory and legislative affairs Virinder Singh.